We value the diets of our clients! A great diet plays a huge role in health recovery, weight management, and heart and organ function! Wether our clients have a heart condition, high cholesterol, diabetes, or mobility restrictions! We provide top quality home health care services to improve the over all quality of life for our patients! Vegetables play a vital role in our diets, as they support the normal functioning of the different body systems. They do so by providing our cells with vitamins, minerals, fiber, essential oils and phytonutrients. While eating cooked vegetables is healthy for you, in certain instances it is advantageous to eat raw vegetables. This is because cooking destroys essential nutrients such as vitamin C and also kills vital enzymes that help your body to digest such foods. Diabetic Dieting – A diabetes meal plan is a guide that tells you how much and what kinds of food you can choose to eat at meals and snack times. A good meal plan should fit in with your schedule and eating habits. What should I eat? Use The Healthy Eating Plate as a guide. Using Harvard’s Healthy Eating Plate as a guide, we recommend eating mostly vegetables, fruit, and whole grains, healthy fats, and healthy proteins. We suggest drinking water instead of sugary beverages, and we also address common dietary concerns such as salt and sodium, vitamins, and alcohol. It’s also important to stay active and maintain a healthy weight. Healthy drinks, Some beverages should be limited or consumed in moderation, including diet drinks, fruit juice and milk. Alcohol in moderation can be healthy for some people, but not everyone. Salt and sodium and vitamins. Salt, also known as sodium chloride, is about 40 percent sodium and 60 percent chloride. It adds flavor to food and is also used as a preservative, binder, and stabilizer. The human body needs a very small amount of sodium – the primary element we get from salt – to conduct nerve impulses, contract and relax muscles, and maintain the proper balance of water and minerals. But too much sodium in the diet can lead to high blood pressure, heart disease, and stroke. Carbohydrates. What’s most important is the type of carbohydrate you chose to eat because some sources are healthier than others. The amount of carbohydrate in the diet – high or low – is less important than the type of carbohydrate in the diet. For example, healthy, whole grains such as whole wheat bread, rye, barley and quinoa are better choices than highly refined white bread or French fries. Recipes, Healthy eating begins in the kitchen, whether it’s in a home, restaurant, dining hall, or other venue. To get the most out of the recipes you prepare, keep your kitchen stocked with ingredients from the Healthy Eating Pyramid. 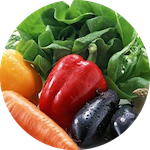 Healthy weight and staying active Guidelines, recipes, and other resources for creating and promoting healthy, delicious foods in schools and at work sites.